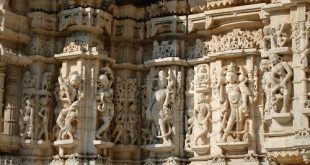 Rajasthan is known for its royal grandeur and royalties. It attracts tourists from all over the world with its beautiful traditions, culture, people, history, food, and monuments. 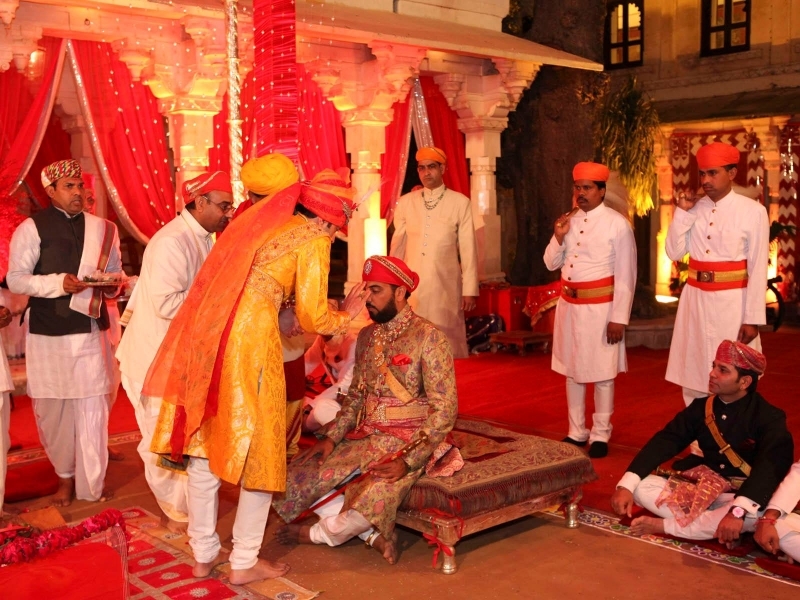 Apart from their clothes and food the royalty is also seen in Rajasthani wedding Rituals. The Rajasthani weddings have lots of rituals and Rajasthani bride and groom perform most of them at their respective homes. 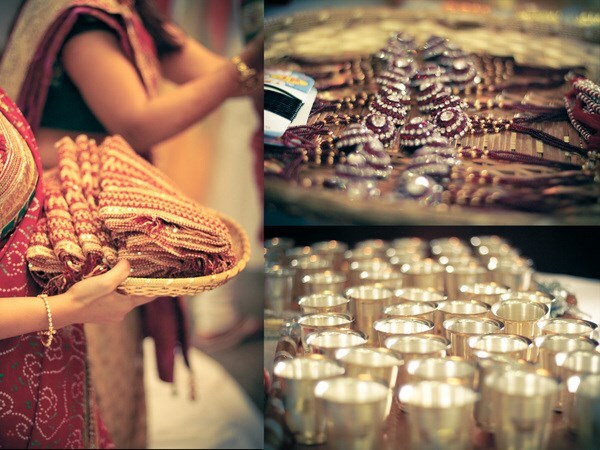 The traditional dance, music, gorgeous wedding jewelry, Rajasthani wedding rituals is mesmerizing for any spectator. The splendor of the wedding costume reflects an exclusive appeal. There are number of pre-wedding, wedding day and post-wedding rituals that are rooted in their ancient tradition. 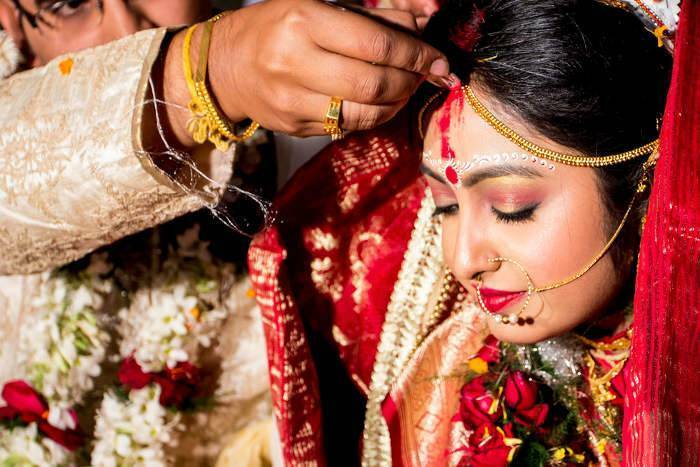 The very first ritual is the engagement ceremony and it is also known as Tilak Ceremony in Rajasthan and this engagement ceremony usually takes place at the home of groom-to-be. 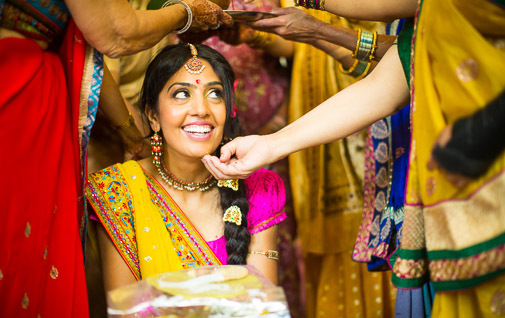 The male members of the bride’s family visit the groom’s place and the bride’s brother applies Tilak on the groom’s forehead and also offers the sword and other presents. After the Tilak ceremony, the Ganapati Sthapana & Griha Shanti Pooja ceremony is held. In which the bride and the groom’s family perform havan before two days of wedding and install the idol Lord Ganesha.in the home to receive the blessing for the would-be-bride and groom. 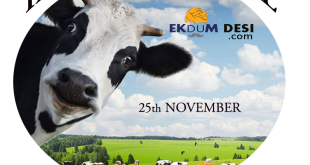 The next is Pithi Dastoor. This Rajasthani wedding ritual is also known as Haldi Ceremony in which the bride and the groom are applied turmeric paste. In bride’s house this ritual is very elaborative. Bride wears a orange traditional dress and it is brought under a silken canopy, which is held with the help of swords on the four corners by four ladies who must belong to same clan as the bride. Mehfil or Sangeet forms an integral part in this cultural wedding. There are separated mehfils are organized for both men and women. At the ladies side, all the womenfolk gather at a centeral place in an enclosed courtyard or hall. The womenfolk are in dazzing dresses and they perform the Ghoomar (a special dance done in a group). Of course, the men have their own Mehfil, where singers perform and these are strictly all male parties. After singing and dancing the next ritual is Mayera Dastoor in which the maternal uncle (Mama ji) of the groom/bride, who, along with his wife and family, arrives with much fanfare, and is received by the bride/groom’ mother with traditional welcome. 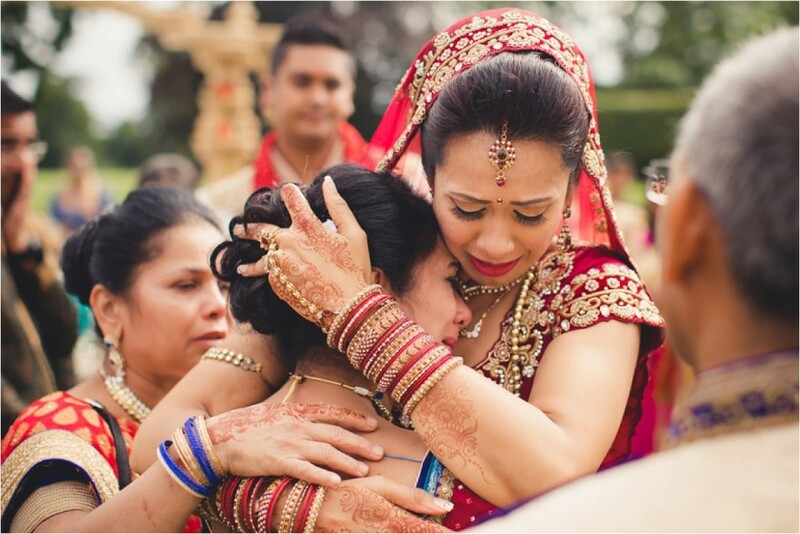 This ritual signifies that since at the time of a wedding there is considerable expenditure, it is the duty of brother to help his sister at her child’s wedding. Another important ritual is Janev, in which the groom is made to wear a white thread. Before wearing a three stranded holy thread (“Janev”), the groom pretends to run away from the marital bounds while his maternal uncle persuades him to lead a married life. 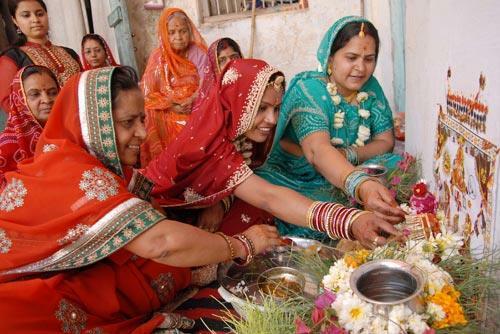 After the Janev, the Palla Dastoor is conducted in bride’s house wherein, the bride worships Goddess Gauri. Finally after all these pre- wedding rituals the wedding day is conducted where, the Baraat visits the bride’s house. It is a regal procession, which does not involve any dancing. The entrance to the Wedding location has a Toran or Dhukav. 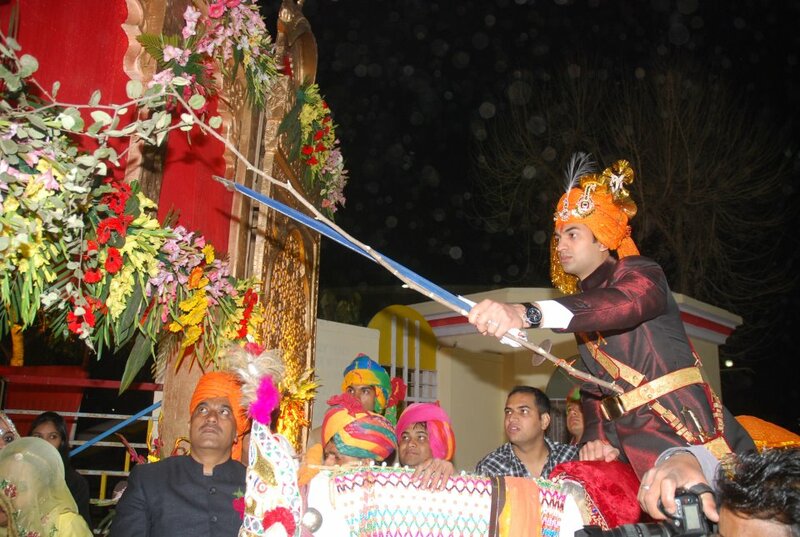 On arrival, the bridegroom hits the Toran with a Sword or Neem Stick after which the mother of the bride does an Aarti and applies Tilak to his forehead. This ceremony is called ‘toranachar’ and is symbolic of warding off the evil eye. This Rajasthani couple is led to the wedding Mandap.where a cloth around the groom’s waist is tied to the bride’s bridal Saree or Vesh. This is Granth Bandhan or Gathjoda. After this, the bride places her hand in her future husband’s hand and holy water is poured into it. This is Paanigrahan. Then bride’s father performs Kanyadan which is the Hindu marriage ritual where the bride’s father symbolically hands over his daughter to her husband. The priest lights the Havan and starts chanting marriage prayers. For the Pheras or Saptapadi, the bride and groom walk around the holy fire and each makes a promise to the other after every round which is known as Phera. At the four corners of Mandap four relatives hold up swords while this wedding ceremony is being performed. After the Pheras are complete, the bride sits on the right of her husband. This is called Vamang Sthapna. In the Seer Guthi ritual, the husband puts red Sindoor in his wife’s center hair parting (Maang). After the wedding ceremony the bride and the groom leave for their marital home, this ritual is known as Vidaai.Then a coconut is placed under the wheel of the car, as the bride unveils herself in front of her husband. Usually, at this point of time, the groom gifts her piece of jewelry. On arrival at the groom’s house, his family welcomes the newly couple. This is called the Grihapravesh custom. After the Grihapravesh, Pagelagni tradition is followed. According to this custom, all the members of the groom’s family are introduced to the new bride and they present her with gifts. 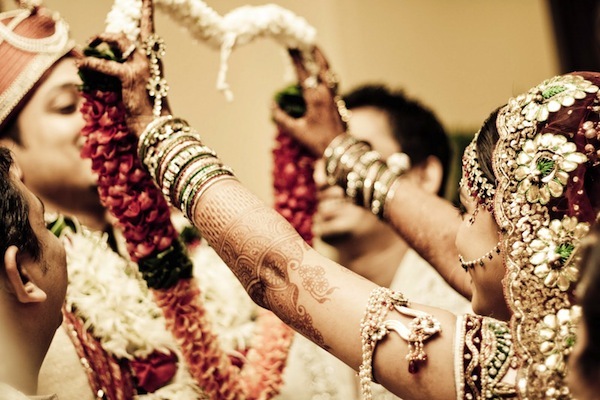 Rajasthani wedding rituals is the most desired wedding celebration for all Indians. 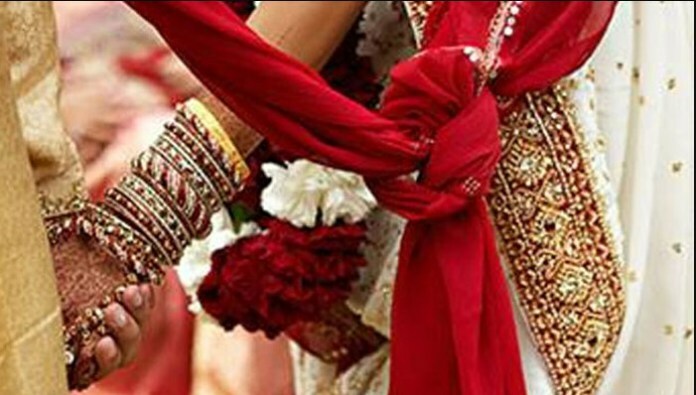 Marriages may be made in heaven, but many are surely billed in Rajasthan. 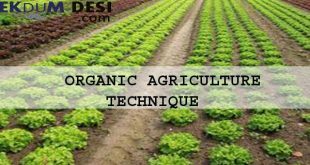 Everyone is attracting towards organizing Rajasthani wedding rituals.